Manicouagan: Impact Crater or Lightning Scar? A giant ring-shaped crater in Canada seems to be the result of a meteor strike. Could electrical scarring be a better explanation? In previous Thunderbolts Picture of the Day articles about so-called meteor impact sites on Earth, we pointed out that the features in and around the craters can be more readily explained if forces other than mechanical shock and thermal stress are considered. Some of the more important considerations are the lack of impact debris, multiple concentric rings, glassified spherules, shallow depressions and steep sidewalls. One of the largest such structures on Earth is found in Quebec, Canada. Manicouagan crater's coordinates are N 51° 23' W 68° 42'. The crater is approximately 100 kilometers wide with a central uplift region 25 kilometers in diameter. Its age is thought to be over 200 million years. The uplifted central plateau rises almost 500 meters above the surface of the annular lake that fills-in the ring-shaped structure and the peak is close to 800 meters. The crater's name comes from the Manicouagan River that flows nearby and means, "the place where there is bark." The name apparently refers to the manufacture of birch bark canoes. 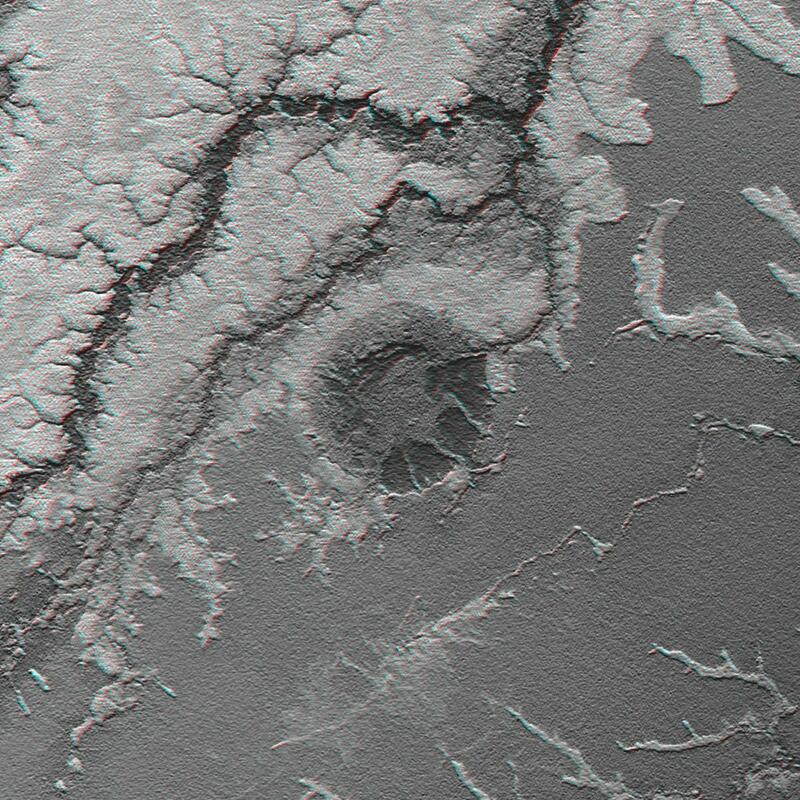 According to standard geological theory, a relatively fine pattern of striations indicates that much of the material surrounding the crater has been scoured away by glacial erosion. Almost one kilometer of overlying rock is supposed to have been removed, including the crater's original rim that enclosed an area three-times greater than the current topography. The raised central plateau is composed of igneous and metamorphic rocks that are resistant to erosion so little of it was worn down according to conventional thinking. In the image at the top of the page, analyzing the topographic slope in the north-south direction created the shaded colors. Northern slopes are rendered bright and southern slopes are dark. 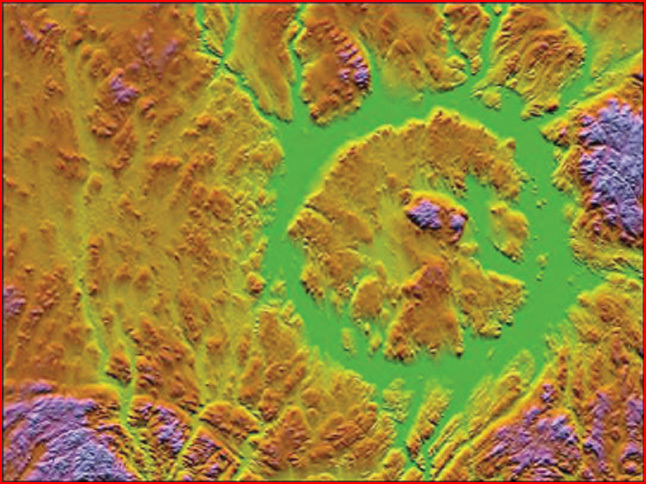 The colors are related to height: green indicates the lowest elevations, increasing with yellow, red, and magenta, to blue at the highest elevations. The overall structure is similar to Libya's Kebira crater - although Kebira is 31 kilometers in diameter, much smaller than Manicouagan. Because the two formations are like other craters with similar morphology, we may use the same qualitative techniques for investigating their origins. Around the Manicouagan site are minerals that seem to indicate tremendous shockwaves have passed through the strata. In many layers, biotitic mica is found in "kinked bands." Shattercones also exist in the layers surrounding the crater. Shattercones are the result of overpressure through the rock, causing it to compress in distinctive v-shaped formations. Most geologists believe that shattercones are undeniable evidence for the meteoric impact scenario, so their presence provides confirmation for the theory. Melted rocks and fused breccias are also thought to be confirmation for the theory, since craters in other parts of the world reveal the same effects. But can the impact of a big rock moving at 45,000 kilometers-per-hour be the cause of these various phenomena, or should we look to electrical forces for the answers? Shattercones can be construed as evidence for electric discharges through the stone. A discharge powerful enough to form a 100-kilometer crater would be sufficient to generate shattercones pointing to the blast origin. It is significant, therefore, that shattercones in the Vredefort Dome, South Africa, point downwards and to different points of origin. In an impact crater, the shattercones should point upwards to a single point. The Vredefort Dome is evidence for a traveling underground blast like that expected from a rotating Birkeland current. There is another possible mechanism that produces the characteristic pattern of a "shattercone." In other Picture of the Day articles about Mars, shattercone patterns of incredible size were illustrated. We have identified the formations as dendritic ridges and their shape is remarkably similar to those in Manicouagan. Shattercones may be Lichtenberg figures preserved in the stone. Lichtenberg figures have been addressed many times in these pages. They are the remains of electric discharges through solids and they leave behind singular shapes in the material after their passage. Lightning strikes on pavement and in soils leave Lichtenberg figures carved into them by the explosive current flow. Based on the presumption of an electric discharge, Manicouagan ought to display those features that have been described elsewhere as electrical. One example is the layering of distributed debris. A spinning electric arc will machine down through layers of soil, blasting the melted slag across a wide area as it snakes through the terrain. In fact, some of the geologically unique minerals around Manicouagan have been found in Great Britain as tiny glassified stone droplets. Surrounding the crater are several sinuous channels, additional evidence that the impact hypothesis cannot explain. 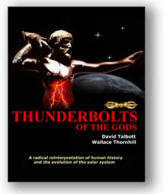 In general, most of the so-called meteor craters around the world should be reconsidered from an electrical perspective. The Merewether Impact Structure, the Iturralde Impact Structure and many other sites could be of electric discharge origin and not where big rocks fell from space.